Readers Comment from UK debt under Labour. In 13 years from 1997/8 to 2009/10, the Labour Government increased debt by about £420 billion. In the 5 years from 2010/11 to 2014/2015, the Coalition Government will increase debt by about £600 billion. These are the facts. 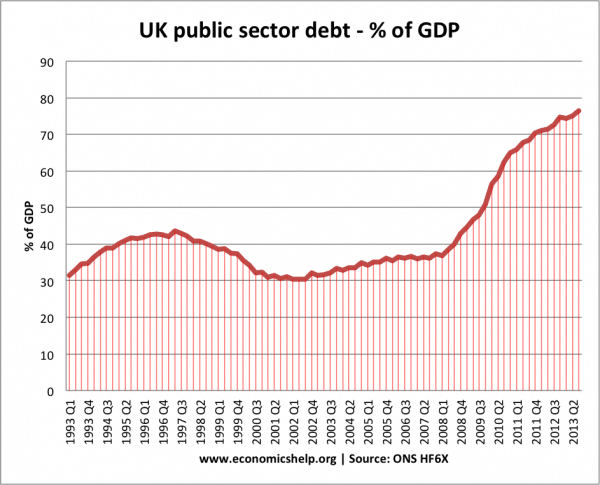 It is true that under the Coalition government of 2010 onwards public sector debt has increased significantly. Debt to GDP has increased at a rapid rate. But, that doesn’t mean it is a reason to blame the coalition government for rising debt. Rising public sector debt was both inevitable and desirable given the poor global economic performance, shrinking tax base and expansionary fiscal policy of the previous government. I would argue, that 2010-2014 – it’s a shame government borrowing didn’t increase a little more. In a recession, with a fall in private sector spending, and rapid rise in private sector saving – you want to see an increase in government borrowing to help maintain overall demand, especially with Q.E, low inflation and low interest rates,. Comparing debt levels from 1997 to 2010 and comparing debt levels during the great recession is a very difficult comparison. The economic situation is so different, that the required response needed is also very different. 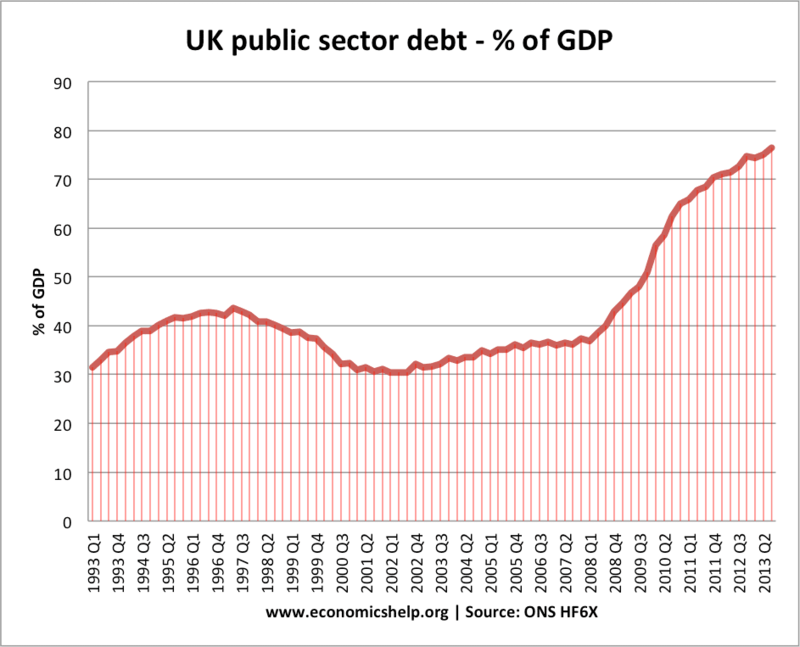 However, the point about UK debt under Labour. was to make the point that (contrary to many people’s opinion) UK government borrowing had fallen to a near record post-war low in the run up to the credit crunch. Excessive government borrowing was definitely not a cause of the crisis of 2008 onwards. Another thing that can make me suspicious is when people point to very recent quarterly economic growth figures and claim that as vindication or otherwise of a particular economic policy. The government didn’t follow through with all its threats of austerity and have actually increased government spending. If GDP falls, the natural response is to bounce back – whatever government policy is. The remarkable thing about this recession was how long the recovery took to materialise. 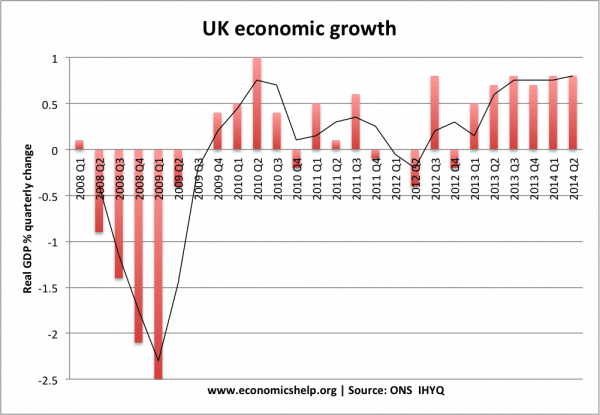 If you get a massive collapse in GDP, then it is easier to have impressive quarterly growth figures. But, you need to look at the bigger picture. 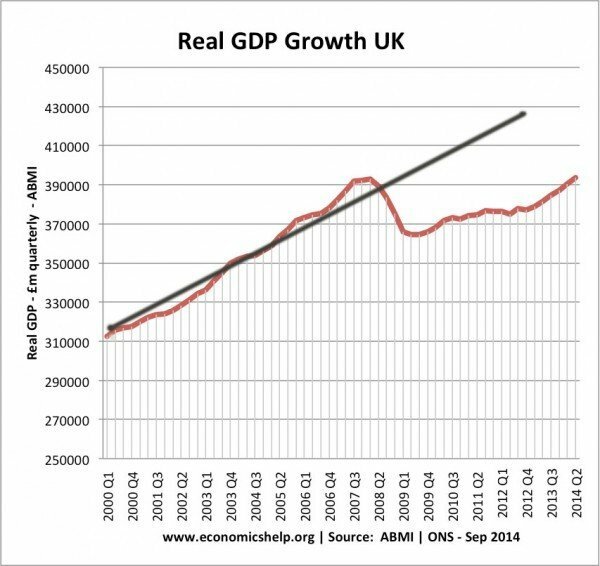 Should GDP have been higher? Should the recovery have come quicker? How much damage was lost by the period of high unemployment? Greece recently had positive economic growth, but does that mean the Greek economy is doing well? Similarly, if a crisis in the Eurozone plunged the UK economy back into negative growth, it doesn’t necessarily mean the government’s handling of the economy has got much worse. To some extent all governments are at the mercy of external factors. What matters is whether the approach to the set of circumstances was the best possible response. Also, although the UK government could have done a better job post 2010, it could also have been much worse. The economic recovery is good, considering the state of the European economy. The coalition government avoided the excess of European austerity. Flexible labour markets have widened inequality, but they have helped unemployment fall. But ironically, it is probably the Bank of England which has had a bigger impact on the economy that government policy. It is interesting that governments will get judged by the decisions of an unelected committee of Central Bankers. But, that’s modern politics. Be very wary when someone points to a particular point of data as justification for a particular policy or political party. It’s always much more complicated. Everything needs to be judged in the context which it appeared.